Lucky Reptile Eco Bark Bedding Substrate is an excellent pine bark substrate for use in glass terrariums for tropical set ups. The Eco Bark is made via a multi-step manufacturing process which reduces dust and dirt and produces a uniform high quality substrate. 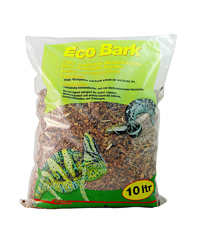 Lucky Reptile Eco Bark is suitable for tropical reptiles, snakes and tortoises. Spot clean the substrate daily to increase the time needed between total clean outs. The Eco Bark will stay looking fresh and new for a long time as it will only rot slowly, provided there is adequate ventilation within your enclosure.